An unusual exotic looking shrub, with large deeply lobed dark green leaves. Stiff rounded sprays of tiny creamy flowers appear in October, that contrast well with the darker foliage. Small, inedible black berries follow in autumn. Thrives in most soils and is reasonably drought tolerant. Prefers partial-shade but will also do fine in a sunny site. A good choice for coastal areas or town gardens and makes a good specimen bush. A variegated form is available. Originates from Japan. Average height and spread 10 x 10 ft (3m x 3m). May typically be grown as a house plant but is moderately hardy in most parts of UK. Requires winter protection in very cold areas. A fast-growing shrub that tolerates most conditions. Provides an interesting tropical look. Usually grown as spreading shrub and especially suitable for the back of the border or under the dappled shade of other plants. Prefers partial shade, in a sheltered spot. Likes fertile, moisture-retentive, soil. Tolerates clay or chalky soil and exposed coastal sites. Water well, except in winter. Feed regularly in growing season. Hardy in most areas of UK. Protect plant in severe weather. It can be killed back to the core in a very bad winter but should sprout again from ground level in spring. In milder years it will remain evergreen. No pruning necessary. Cut away dead and damaged foliage in the spring. Removing old, congested or damaged stems at their base. Fatsias can be increased by cuttings taken during August and September. Select young healthy shoot tip cuttings, 3in (75mm) long (or take root cuttings) and provide bottom heat. Alternatively sow seed in spring. Glossy, leathery, palmate leaves 300-400mm (12-16in) wide, with deep lobes. Large, branching clusters of small white flowers in October/November followed by black pea-like berries. 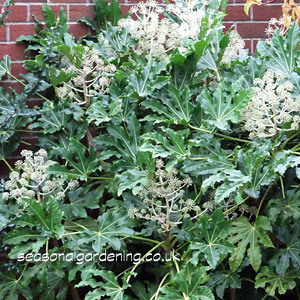 A hybrid between fatsia and hedera (ivy). Tall with smaller five-lobed, dark green or variegated leaves. May grow to 10ft (3m) or more.